Germans love careful planning almost as much as beers and festivals, which means the planning for Oktoberfest is best done months in advance. If you want to visit Munich this fall for the special holiday and hope to make the most out of your experience, you'll want to reserve your table in a beer tent as soon as possible. The beer tents at Oktoberfest fill up quickly, and while it is still possible to attend without a reservation, claiming a seat beforehand makes for a much more relaxing experience at the biggest folk festival in the world. The festival takes place every year for about two weeks from late September to October. For most tents, you can make a table reservation for Oktoberfest starting in January or February, with confirmations sent out around March. Pick the Oktoberfest beer tent that you would like to visit; each has its own personality ranging from family-friendly to youth-centric, traditional to celebrities-only. It's also important to note that some provide special events like family days and "Gay Sunday." In order to make reservations, contact "your" tent directly. Visit the website of your beer tent and find out how early they accept reservations. Some beer tents accept reservations as early as November or December the proceeding year, but most hold off til the reasonable time frame of late winter. Determine how you should apply. More and more tents offer reservations online and in English, but some still prefer more traditional methods like email, phone, or fax. You have to include how many people will attend and the day and time of your visit when you book your reservation. Beer tents require a minimum of 10 people for one table, and guest can be only be added in multiples of 10. The reservation is free, but you have to purchase food and drink coupons (usually for a roast chicken or other entree and a mass or two beer) in advance. These prepaid coupons are usually between 40 and 80 Euro per person depending on the beer tent. If you have less than 10 people, you'll have to pay for the entire table but you’ll get the money back in food and drink vouchers. Wait. The beer tent will contact you about your reservation and this can take a few days to a few months until you hear from them, but most answers arrive by March. The beer tent will either confirm or decline your reservation. If they decline, some tents will offer you an alternative time or day or will put you on a waiting list. Online reservations have made this system infinitely more straight-forward as you can usually see what dates are filling up before sending in your reservation request. Your beer tent will either send you your prepaid food and beer vouchers or will let you know when and where to pick them up. 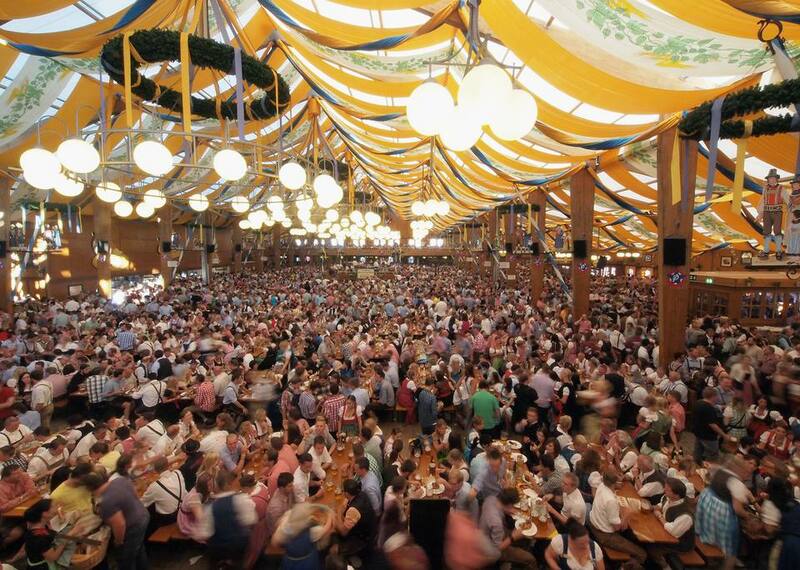 At Oktoberfest, make sure to be on time; otherwise, the beer tent might let your reservation go. Weekends are notoriously crowded, making it rather difficult to book reservations. It's easier to get a reservation earlier in the day or during the week. The ideal time to book is noon to 4 p.m., but you can also choose more than one date to increase your chances. The Oktoberfest barometer is a helpful tool to find historically low attendance days. If you're late to the Oktoberfest planning party and believe you may have missed your window for reservations in January or February, it never hurts to check the website for each beer tent. You might still be able to reserve a table during weekday afternoons even as late as June or July. Be flexible and sign-up on the waiting list. No reservation? Keine Sorgen (No worries). The city of Munich requires Oktoberfest tents to keep one-third of the seats in the central aisle unreserved during weekdays and all of them on weekends. If you arrive when the tents open at 9 a.m., you have plenty of time to enjoy until the reservations kick in at 4 p.m. The biergartens are also a good option when the weather cooperates because there is no reserved seating in these areas. Instead, you can mingle and move around as you please. However, these biergartens may also be much more crowded than the individual beer tents. If you really can't get a seat, consider going to one of Germany's many other boisterous folk festivals.